The number of mainboards with integrated AC'97 sound is growing up. A lot of them come even with digital S/PDIF-outs and a 6-channel codec. However, separate PCI sound cards had better software support so far than integrated sound. They offers such things as a 3D sound in games, numerous multifunctional utilities and programs with a pleasant interface. If you remember, last year Intel unleashed a quite powerful software support of sound subsystems of its mainboards. 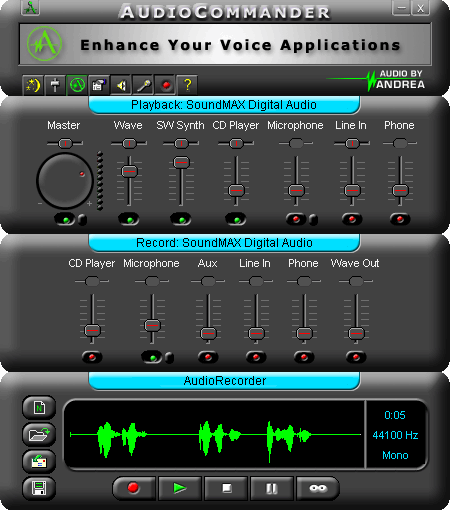 It was SoundMAX with SPX (see Integrated AC'97 sound in the Intel D815EFV mainboard : http://www.digit-life.com/articles/inteld815efvac97/index.html). This time the company is touting a new, improved version SoundMAX Cadenza. 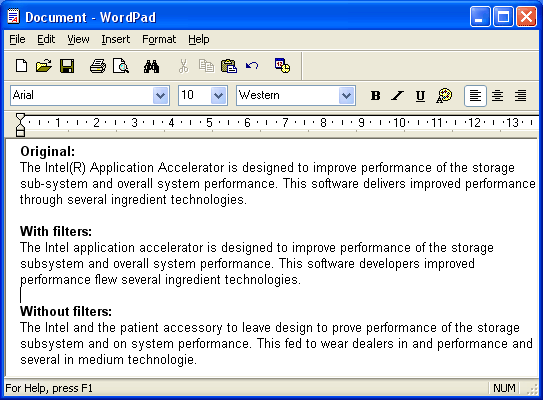 The changes were brought both into the hardware and software parts. The codecs of Analog Devices of the 18 series are replaced with newer ones of the 19 series. They acquired digital S/PDIF-outs with Digital Rights Management (DRM) support, and auto detection of a configuration of speakers. Now it's also possible to realize 6-channel sound without additional CNR cards. Additional analog-outs can be embodied in separate connectors or in the mic and line inputs. Let's examine the SoundMAX Cadenza technology in the Intel D845PEBT2 mainboard. 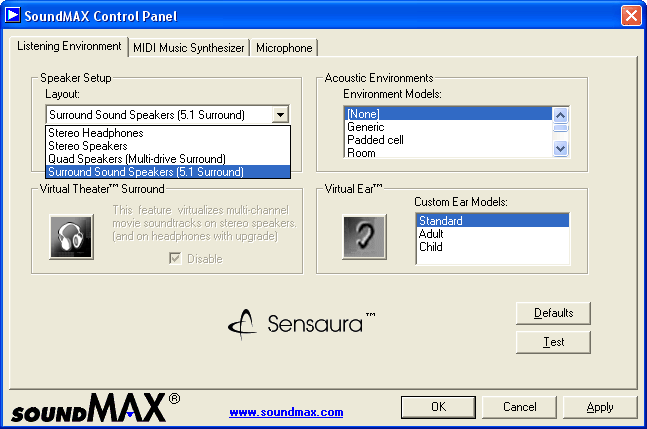 By the way, other manufacturers (for example, ASUS in the P4PE) also promise the SoundMAX support in their products. The commutation panel has all connectors, but they are not combined: line-in, mic-in, line-out to front speakers, line-outs to rear speakers, central and subwoofer channels. The PCB has also unsoldered digital coaxial and optical S/PDIF connectors. The optical connector is covered by a dustproof shutter. In this case we have a 6-channel AD1980 codec. Let me remind you how the AC'97 sound works on mainboards: as modern CPUs are much more powerful than DSPs of sound cards and data are anyway stored in the RAM, it was decided to shift sound stream processing to the CPU, leaving only an AC-Link controller integrated into the chipset's ICH which applies a ready signal directly to the AC'97 codec. 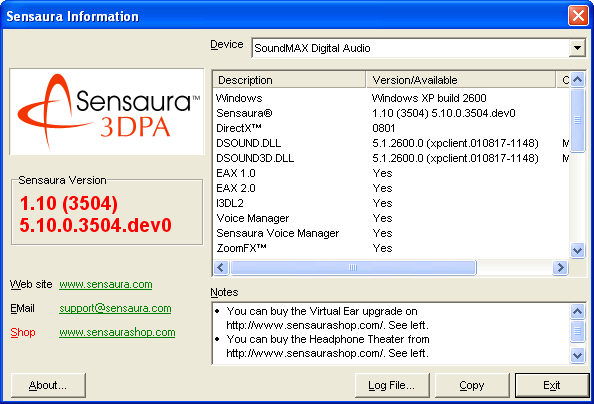 From the software standpoint, the 3D sound is supported via Sensaura 3D algorithms. There are modes for headphones, stereo, 4, 5.1 speaker configurations. 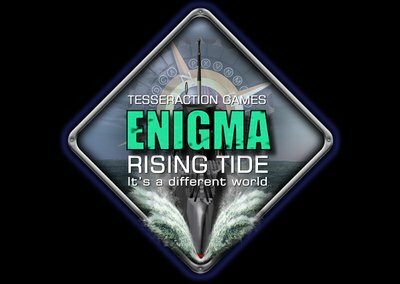 You can apply to sound various effects of simulation of reflection environments. The Virtual Theater 5.1 Surround allows for a virtual 5.1 sound in two speakers. The extended settings of the Sensaura Virtual Ear and Sensaura Headphone Theater are still available only for a definite fee. The MIDI is supported by the software synthesizers Yamaha XGLite 1.2 MB and an alternative GM synthesizer with loadable DLS2 banks (one such 4MB sample marked as Professional comes with the board). 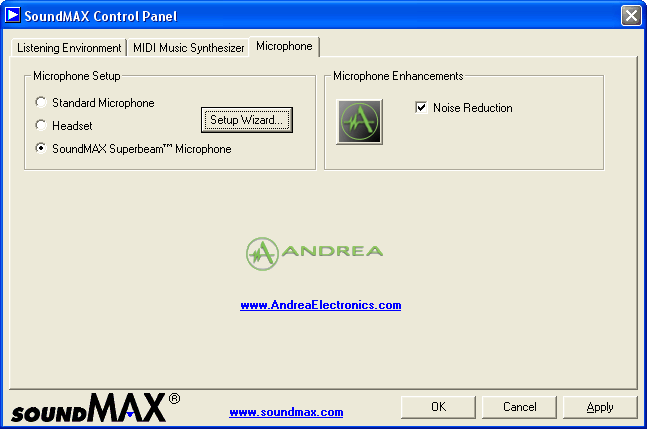 Owners of the mainboards supporting the SoundMAX Cadenza technology can get at a discount a special microphone SoundMAX Superbeam from Andrea Electronics and a software suite supporting speech recognition. 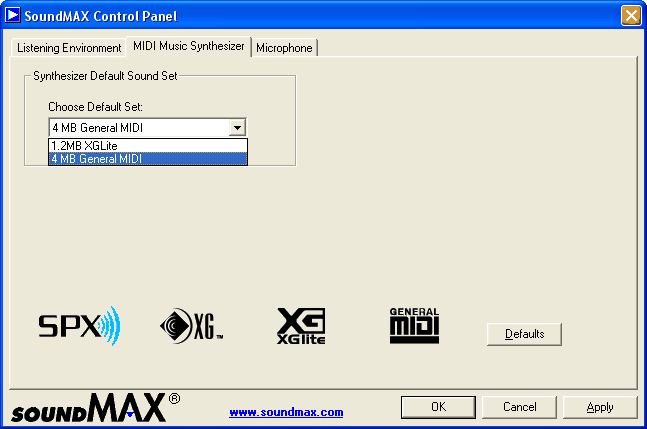 You can download a special test utility that checks compatibility of your hardware with the SoundMAX Cadenza. It's not necessary to put this microphone close to your mouth, like many others. You can attach it to the upper panel of your monitor as it provides a far-field voice input and has a noise cancellation system in its drivers. 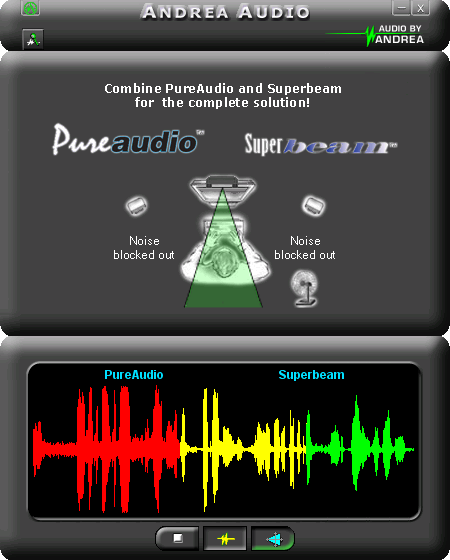 On the manufacturer's site you can watch a quite interesting technological demo that demonstrates operation of the PureAudio and SuperBeam algorithms. Actually, there is nothing new here. Any audio editor has plugins for dynamic processing of a sound signal. And any professional sound recording with a microphone can't do without a noise-gate, de-esser and compressor with a limiter (in case of bad records you can pump it also through a de-hisser). Here sound is processed on-the-fly on the drivers' level; fortunately, modern CPUs cope with it easily. So, now it's much simpler for the speech recognition programs to work. 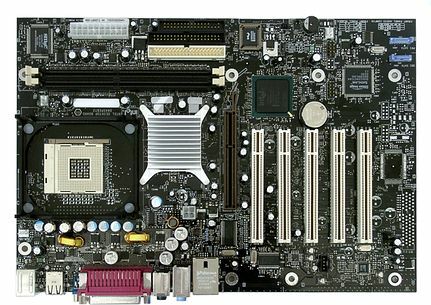 The computer is based also on the P4 2.53 GHz and 512 MB DDR333. When all the drivers are installed the tray shows icons for standard tabs with the SoundMAX settings. And there is also a new tab devoted to a microphone. It's interesting that it supports standard microphone and headsets. 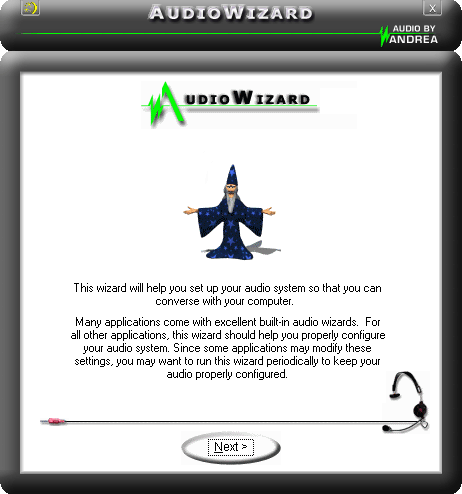 For the SoundMAX Superbeam there is a separate Wizard that can adjust automatically a record level. All the controls are put into a single utility named AudioCommander which looks like an audio center. 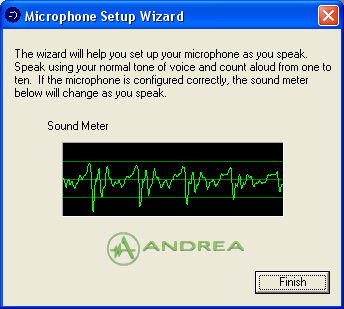 There is an AudioRecorder that can prove that the noise elimination technologies are enabled (they can be set on/off in a special window). 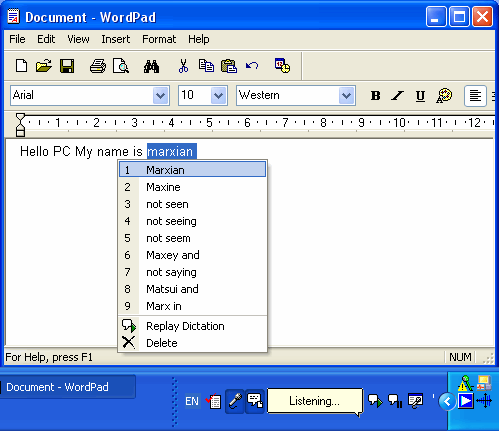 After installation of the special software, in any applications dealing with text input and editing in the Windows' Language bar you can find icons that control the speech recognition system. The first thought that struck me was to greet the computer and introduce myself. Speech recognition with the SoundMAX Cadenza is reality! Unfortunately, there is no my name in its base. :) The computer tries to analyze the sentence and select most appropriate words. By the way, unrecognized words can be selected from a list of similar words or you can redictate them. Inspired with such a success :) I decided to dictate a more difficult text and find out how effective the offered filtering system is in the real time mode. I took a paragraph from the readme.txt of the Intel Application Accelerator utility and voiced the text at an average pace, 2-3 words a second, in a continuous speech with small semantic pauses. Below you can take a look at the original text, then at the recognized text with filters and after that goes the recognized text without the filters. More difficult task: a real text. The signal filtering system integrated into the SoundMAX Cadenza improves the recognition several times! So, in the first case the system didn't put correctly 2 words out of 26, and in the second case 12 out of 26. So, it makes sense to use speech recognition only with such a filtering system. Otherwise, the dictation is useless. We used the RightMark DirectSound 1.0 alpha to measure CPU usage with the different number of streams. 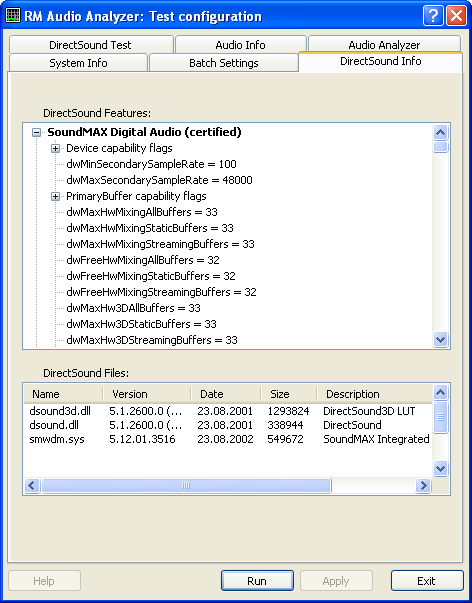 The diagnostics of the DirectSound defined 32 DS and DS3D hardware streams, i.e. first 32 voices are processed with the special Sensaura 3D algorithms. If there are more voices, the Microsoft's software algorithms will be used. One must understand this difference. Analog Devices states that on modern powerful CPUs (P4 1.4 GHz and higher) a software sound of the SoundMAX works faster than a hardware PCI sound card. To verify it we used the RightMark DirectSound, an entirely software card ESI WT192X on the new chip VIA Envy24HT (as a PCI solution), the Creative Live!5.1 on the EMU10K1 and the latest hardware card Creative Audigy2 on the DSP of the same name. Well, the difference is inconsiderable. I suspect that when the SoundMAX Cadenza is used the processor gets a computation load mostly from the sound positioning algorithms because even in the stereo mode there are presets for speakers placed closely or far from each other and the Virtual Ear technology that can't be disabled. Here we used our RightMark Audio Analyzer 4.2. A signal level on the line-out of the sound subsystem of this mainboard is rather low. That is why in the tests with higher-quality cards we had to lift up the signal level in the reception part (section?) that is why the results do not differ noticeably from the input-to-output tests. The digital signal processing which can't be disabled make an effect as well. In the 44 kHz mode which is basic for playback of MP3, CD and sound in games there are problems with resampling into 48 kHz. Even excluding the intermodulation distortions the THD+N at a 1 KHz sinusoid makes 0.1% with A-weighted applied, though Analog Devices states that the codec is able to operate at any reference frequencies (like in case of any professional card). But to make things simpler the frequency is forcedly resampled into 48 kHz in the drivers. At 48 kHz the characteristics look more or less good except the frequency response. The frequencies lower than 40 Hz are filtered out, and there is a peak at 75 Hz and a drop at 140 Hz. Probably, that was an attempt to intensify basses on computer speakers. Such frequency response appears in all operating modes. This is exactly an output as the same response is obtained with a line-in of the reference card WT2496. When we tested the board with the AD1885 codec last year we didn't have such problems with the frequency response. This looks like a bug of the drivers because there is a hump even in case of rerecording with an internal mixer of the card. In the listening tests we used wooden multimedia speakers Microlab SOLO-1 which had enough reserve to make differences between sound cards noticeable and which are quite popular. Also, we used the Sennheiser HD600 headphones. Inexpensive widespread multimedia cards usually have an acceptable sound quality level - certainly not Hi-Fi/Hi-End but sufficient for computer acoustic systems. There wasn't much difference from the Live!5.1 with the Sigmatel STAC9708 codec when we listened to MP3 and CD though the SOLO-1 speakers. But because of lacking mumbling in the LF range the sound produced by the Live!5.1 card was more melodious. As you know, the line-out of the card is designed for high-resistance load, and is not meant to be used with headphones. But makers of sound cards and AC'97 sound devices provide linear buffering in the output stage to "please" both a linear load of an active acoustic system and low-resistance headphones. In this case, thanks to the built-in buffer the codec managed to get a very high volume level from the Sennheiser HD600 headphones. And even at the maximum volume level, which was impossible to bear, the sound section didn't look like overloaded at all. In the 5.1 mode the signal is distributed among all the speakers. Unfortunately, there is no option in the settings to adjust a cutoff frequency of the subwoofer's crossover. The DVD players PowerDVD XP and WinDVD4 can see all configurations of the speakers - from stereo to 5.1 and S/PDIF pass. We tried a full version of the 3D shooter UT2003 which supports the hardware DS3D+EAX. The 3D sound of the SoundMAX Cadenza was more effective than that of the Live!5.1 card. In general, the SoundMAX Cadenza makes a pleasant impression. And if it's still impossible to call an integrated sound a full substitute for conventional sound cards with a PCI bus, the arguments for a separate sound card are quickly melting away. The most attractive thing is that such built-in solutions are very advantageous for manufacturers and end-users. Well, they have to solder in only a wee 6-channel AC'97 codec and several colorful connectors. The SoundMAX Superbeam stereo microphone and the real-time signal filtering technology turn the speech recognition into reality. At last powerful central processors got the work for their exorbitantly high gigahertz. At the same time, the driver writers of Analog Devices do have problems to solve. There is no a 44 kHz mode without resampling into 48 kHz, which can be done on the hardware level. The frequency response has a strange hump in the LF range. It's impossible to adjust a crossover's frequency for the 5.1 mode. No equalizer or at least tone controls. I hope all the revealed bugs will be dealt with, and the next driver version will have no such problems. 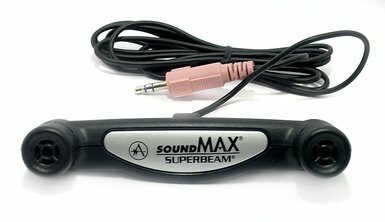 stylish far-field stereo microphone SoundMAX Superbeam.